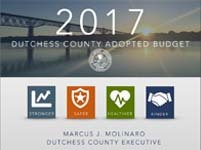 The 2017 Dutchess County Budget was adopted on Thursday, December 8th in a 24-1 bipartisan vote by the Dutchess County Legislature. 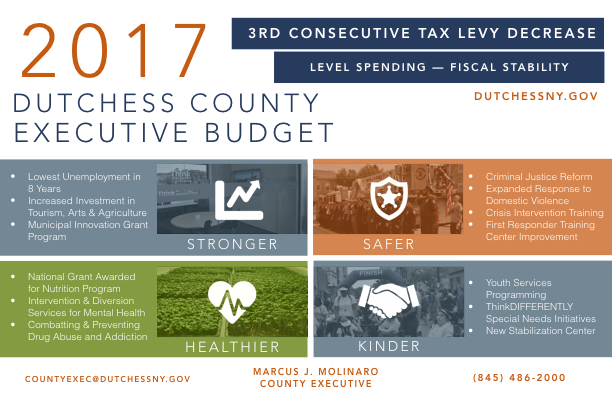 The 2017 budget keeps spending level and continues to maintain the county’s fiscal stability, while delivering the third consecutive tax levy decrease and a reduction in the tax rate for property taxpayers. 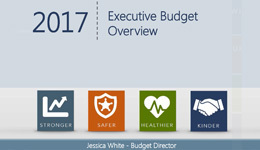 Read the full 2017 Adopted Budget news release here. County Executive Molinaro hosted a county-wide Tele-Town Hall on November 1st to provide residents more information about his 2017 budget proposal and answer their questions.